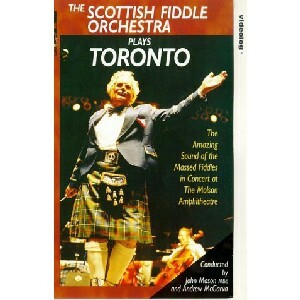 Plays Toronto, The Scottish Music Shop - The Best Selection of Scottish CDs and Scottish DVDs. When John Mason MBE and the Scottish Fiddle Orchestra toured Canada the people opened their hearts to the fantastic sound of this amazing Orchestra. One of the many highlights was the concert held in The Molson Amphitheatre, Toronto and now brought to you on CD, cassette and video courtesy of CPTV. The occasion was thrilling, moving from hauntingly beautiful slow airs to dynamic driving jigs and reels. This was a fantastic experience for everyone involved as you will discover as you join in when 'The Scottish Fiddle Orchestra Plays Toronto'.